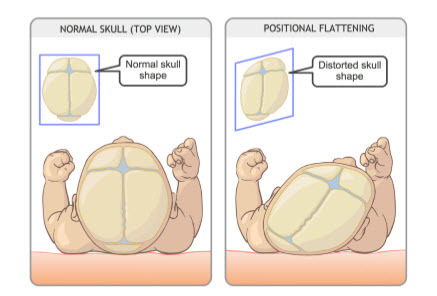 To correct cranial deformity due to positional molding. 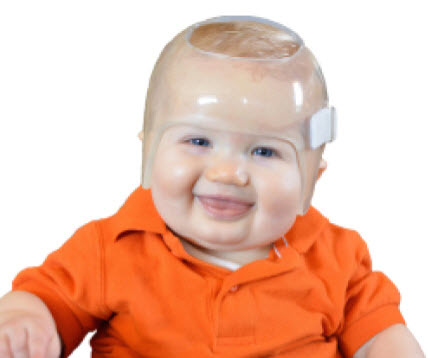 Your child has been diagnosed as having “positional molding.” The current recommendation would be to re-mold the head into a more normal shape using helmet therapy. 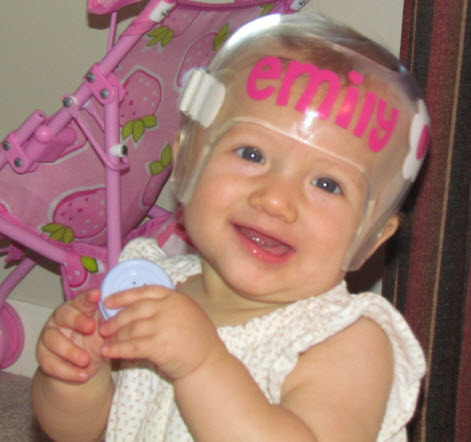 Helmet therapy is a mode of treatment for your child who has been diagnosed as having plagiocephaly. The term plagiocephaly means an abnormal shaped head that can be a result of either positional molding or synostosis (premature closure of one of the soft spots). If your child has synostosis, then surgery would be indicated. No Functional Problems: As far as we currently know, there are no functional problems that can be ascertained from having positional molding. The use of helmets to re-mold the skull is not a new treatment and has been used in some fashion over the past 3-4 decades for this same reason. “Back to Sleep”: The American Academy of Pediatrics has recommended a “back to sleep” campaign to help prevent SIDS. Since this recommendation there has been an increased incidence of positional molding secondary to the child sleeping on the back of his/her head. Position: Some of the mild cranial deformities will improve if the tendency toward plagiocephaly is caught early enough. Your child may have a tendency to sleep more in one position resulting in constant pressure to one side of his/her head. This constant position will result in deformation of the skull. During the early stages, changing the position of your child may help normalize the deformity or prevent any further changes. The deformity may improve on its own within the first six months of life. 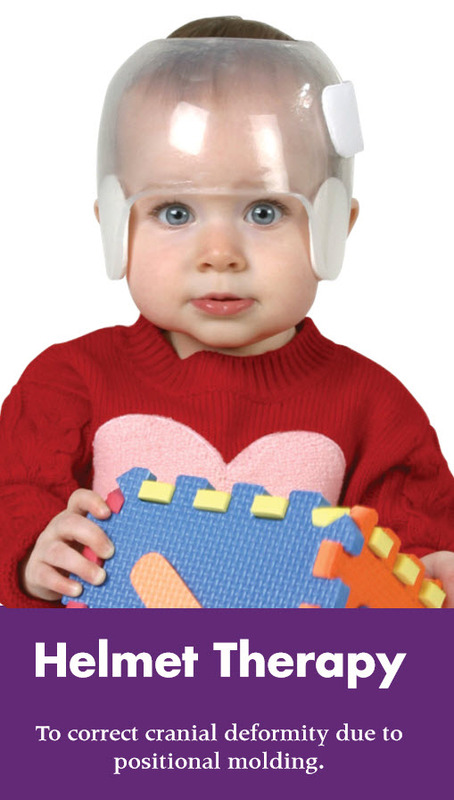 After Six Months of Age: It has been our experience that if the deformity is moderate to severe after six months then helmet therapy would be indicated. Our Orthotist will take a scan of your child’s head and fabricate a helmet designed specifically for your child. This usually takes approximately two weeks to fabricate the helmet. If helmet therapy is to work, then your child will need to wear the helmet on a consistent basis averaging 22-23 hours per day.The helmet may be removed for airing or bathing. It would be unusual for your child not to be able to tolerate the helmet. Most children are able to tolerate the helmet within the first 24 hours. The usual time for helmet therapy averages 3-4 months. This period of time may seem to be long but is quite short in a child’s lifetime considering the long-term effects of having a deformed skull. Once the deformity is present after 14- 18 months of age then helmet therapy is no longer able to improve on the shape. Extensive cranial surgery would be the only way to reconstruct the skull at this time. You will need to make appointments to be seen by your Plastic Surgeon (once every 4-6 weeks) to follow the progress of your child’s therapy and to measure your child’s head circumference. The follow-up visits will be relatively short, but are essential to adequately monitor your child’s progress. Self-Pay Price: Price includes casting, fitting and adjustments by our Orthotist only. We will offer you a 10% discount if the helmet is paid in full at the time of casting. Insurance: If you have provided all of your correct and complete insurance information, as a service to you we will contact your insurance company and will submit the information that they request and/or require for authorization. Authorization is not a guarantee that they will cover the cost of the helmet. Your benefits for coverage will be determined by our billing department and you will be notified of your estimate out-of-pocket expense for the helmet prior to 3D imaging and fabrication. Warranty: We guarantee the helmet to be made to your child’s measurements and anatomical condition. We guarantee against defective material and workmanship for a period of ninety (90) days from the date of delivery. We guarantee repairs and adjustments to be properly complete and free from defective material and workmanship. We will remedy any defect on repairs or adjustments provided the device is returned within thirty days. There will be a minimum charge for all repairs and adjustments not considered being under the new equipment warranty period under warranty. This devide prescribed to you is custom and cannot be returned for credit. Warranties do not apply to adjustments incidental to ordinary wear and tear, adjustment required to physical changes of the wearer or where there is evidence of misuse or alterations by anyone other than the Orthotist.